Before President Donald Trump’s executive order on immigration unleashed a firestorm of debate and waves of protests, it was his plan to build a wall on the Mexican border that was grabbing attention and stirring dispute. Trump's plans to meet with Mexican President Enrique Pena Nieto broke down in acrimony over who will pay for the border wall — eventually being resolved via a phone call on Friday where both pledged to keep their discussions out of the press. But disagreements over who will pay for the wall lingered. Given an executive action signed by Trump has already authorized construction of the border wall, and given that Trump has support from Congressional Republicans, the obvious question is: If Mexico doesn't pay, what could the wall cost the average American? According to Senate Majority Leader Mitch McConnell and House Speaker Paul Ryan, the cost of construction would be somewhere between $12 billion and $15 billion. That comes out to around $100 per U.S. household. That’s pocket change in the grand scheme of things, but it comes in the context of a serious and worsening fiscal outlook for the U.S. Treasury. Let's hope Mexico pays for the wall, because American taxpayers already have a huge bill coming due very soon: The national debt is quickly closing in on the $20 trillion mark, which is worth nearly $62,000 for every man, woman and child in this country. 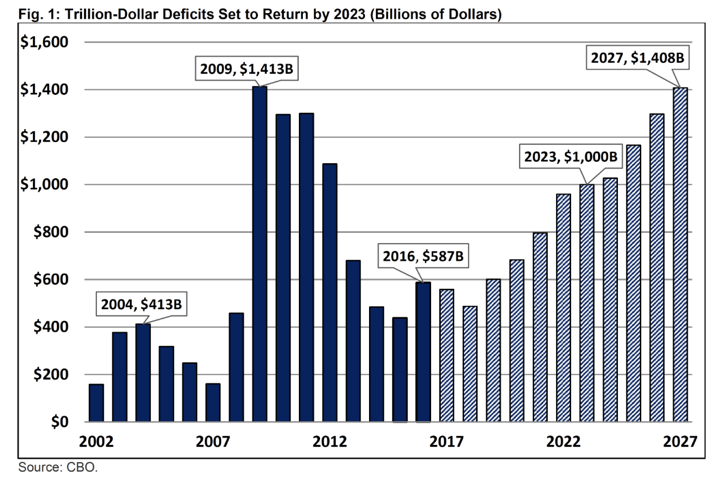 Watch for deficits and the national debt to return to the headlines soon as the U.S. Treasury once again approaches its statutory debt ceiling — the subject of repeated standoffs between President Obama and Congressional Republicans between 2011 and 2013. A fresh update on the fiscal outlook from the bipartisan Committee for a Responsible Federal Budget paints a bleak picture. Under their current baseline forecast, which assumes modest average GDP growth of 1.9 percent over the next 10 years, trillion-dollar deficits will return by the 2023 fiscal year, expanding from $587 billion last year (3.2 percent of GDP) to $1.4 trillion (5.0 percent of GDP) by 2027. As a result, the national debt will grow by more than $11 trillion. Much of this, to be fair, isn't Trump's fault, as spending on "entitlement" programs such as Medicare and Social Security will drive the lion's share of the deficit increase. But possible policy chances, such as repealing certain cost offsets in Obamacare, cutting taxes and eliminating caps on defense spending, would worsen the outlook. If Trump is going to balance the budget, or even just stabilize the debt by shrinking the federal deficit, we're going to need more than a big check from Mexico City. We're going to need sizable budget cuts (we’d have to slash 40 percent of non-entitlement, non-defense spending) and a big acceleration in GDP growth to boost tax receipts (especially if tax rates are cut). CRFB estimates the economy would need to grow, on average, 3.5 percent per year for the next 10 years to make this possible. It's improbable — although that’s exactly what could've been said about Trump's candidacy at every single stage.